Young Artists explore our world of color through hands-on learning and art-making. During these sessions students will learn color theory and make the color wheel with food, Kool-aide, clay and other fun stuff. Students will focus on the process of art-making and learn to listen to their own creative voice. In-process artwork will remain with the instructor until the end of each 4 week session. Parent's are welcome to attend the final 15 minutes of each class. During this time, students will review, present and critique their own work from the session. Students should bring a painting smock, water bottle, and a non-messy snack each class. Registration can be pro-rated for students starting mid-session - call 719-520-1899 to sign up. Ages 7-12 (all levels). Eating the Color Wheel: Young Artists explore our world of color through hands-on learning and art-making. Student's create the color wheel from colored frosting (which they may or may not want to eat though it will be "finger-licking good"). 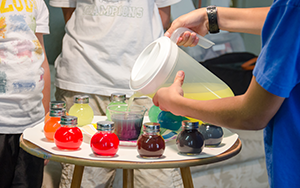 Kool-aid Color Theory: Young Artists explore our world of color through hands-on learning and art-making. 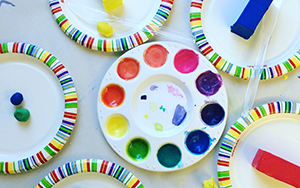 Student's create the color wheel using Kool-aid, paint a color wheel, play art games, draw and paint to music and gain an understanding of basic color theory during this fun and engaging 4 week series. 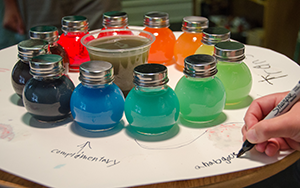 Wear clothes for making KOOL and colorful potions. Marbling with Shaving Cream: Young Artists explore our world of color through hands-on learning and art-making. Students will learn color theory through marbling, using acrylic paint and shaving cream. All materials provided with a $20 materials fee payable to instructor on the first day of class.